Disclaimer: The information on this page is intended for individuals who have been medically diagnosed with heel bursitis. If you suspect that you have bursitis in the heel then it is important to visit a qualified medical professional in order to rule out any other possible causes prior to considering any advice or treatment option. Are you suffering from inflammation, swelling or other painful symptoms of Heel Bursitis? Is Heel or Ankle Bursitis pain affecting your work, sleep or lifestyle? Like most people suffering from swelling, inflammation & the associated pain you probably answered yes to at least one or more of the above questions. If so then it's time to discover the OSMO Patch! 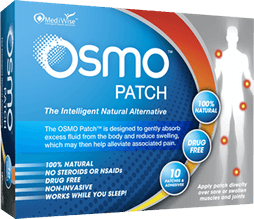 Discover how the OSMO Patch, combination with proper rest, may be one of the most important decisions you can take towards becoming pain free and regaining your quality of life again. We begin you journey by answering some of the most common questions asked from people suffering from this condition.. SO LETS BEGIN! The OSMO Patch together with proper rest now offers an intelligent natural alternative for relieving the pain and inflammation associated with heel bursitis. Continue reading below if you would like to learn more about heel bursitis and discover how the OSMO Patch may help you. What are the signs & symptoms of heel bursitis? Alternatively some individuals may just prefer to avoid painful injections or strong medications and instead use a natural heel bursitis treatment. The OSMO Patch now offers an Intelligent 100% Natural Alternative method to treat pain and inflammation in the heel! The OSMO Patch has been developed to naturally draw fluid out of the body, allowing them to reduce swelling and associated pain in conditions such as heel bursitis (Achilles bursitis, Retrocalcaneal bursitis). When you receive the OSMO Patch just simply stick one over the affected area before going to sleep. The patches will then go to work reducing the inflammation in your heel by removing fluid and stimulating blood flow continually all through the night while you are asleep. Then when you wake in the morning the used patch is just removed & simply discarded. So if you are ready for a natural & effective approach to relieving inflammation and pain caused by heel bursitis then the OSMO Patch is the Answer!